For the British actor, see Eric Berry (actor). James Eric Berry (born December 29, 1988) is an American football safety for the Kansas City Chiefs of the National Football League (NFL). He was drafted by the Chiefs fifth overall in the 2010 NFL Draft. He played college football at Tennessee, where he was a two-time unanimous All-American and recognized as the best collegiate defensive back in the country. He was diagnosed with Hodgkin's lymphoma on December 8, 2014. After going through chemo in the offseason and being declared cancer free, Berry came back for the 2015 season and was named to the Pro Bowl, the AP All-Pro team, and was named the 2015 AP Comeback Player of the Year. Berry was born in Fairburn, Georgia. He attended Creekside High School in Fairburn, and was a standout athlete for the Creekside Seminoles track and football teams. Berry was also a standout athlete for the Creekside High School track team. He set school records in long jump, with a leap of 6.95 meters, and 200 meters, with a time of 21.76 seconds. Berry was the anchor leg of the 2006 Class 4A state championship 4 × 400 metres relay team. Individually, he was the 2005 Class 4A state champion in the 200 meters. Berry received a football scholarship to attend the University of Tennessee. For the year, Berry tied for the national lead in interceptions with 7 and returned them for 265 yards and 2 touchdowns, breaking the record he set the year earlier. Combined with the yards he accumulated as a Freshman, Berry set the all-time career SEC record for interception return yards with 487 yards, only 14 yards shy of the NCAA record for interception return yards, set by Terrell Buckley during his time at Florida State. He also finished the regular season with 72 tackles, 6 pass break-ups and 3 sacks. Berry also took snaps on offense at quarterback and wide receiver, gaining 44 rushing yards on 7 carries. In addition, he gained 32 yards on 2 kick-off returns. He would forgo his last year of eligibility at the University of Tennessee and enter the NFL draft. Correct as of 2008 season end. "As a rule, safeties aren't talked about going that high. But this guy I think in everybody's mind impacts the game. You try to get impact players, and Berry's certainly one." St. Louis Rams GM Billy Devaney. 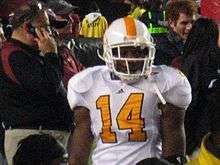 Following Tennessee's 37–14 loss to Virginia Tech in the 2009 Chick-fil-A Bowl, Berry announced his decision to forgo his final year of college football eligibility, entering the 2010 NFL Draft. At the NFL combine, Berry officially ran a 4.47 40-yard dash time. Berry was regarded as the highest scouted safety since Sean Taylor, whom Berry idolized prior to Taylor's death, and was expected to be selected no lower than No. 7, the Cleveland Browns pick. The Kansas City Chiefs selected Berry with the fifth overall pick in the 2010 NFL draft, making him the highest drafted defensive back since Taylor, and the highest drafted Tennessee Volunteer since Jamal Lewis. Berry selected number 29 as his jersey number in honor of former Tennessee defensive back standout Inky Johnson, whose career was cut short due to an injury and also as a tribute to his hometown Fairburn, Georgia, and the main road U.S. Route 29. He and the Chiefs agreed to a six-year, $60 million contract on July 30, 2010 making Berry the highest-paid safety in NFL history. Berry also signed a multi-year endorsement deal with Adidas. In his first season, Berry started all 16 games and became the first Chiefs rookie to be selected to the Pro Bowl since linebacker great Derrick Thomas. Berry had a big impact on the team's defense, helping to improve it from 29th best unit in 2009 in terms of points allowed to 11th in 2010, In addition to starting every game, Berry was on the field for almost half of Kansas City's special teams plays and was the only Chiefs defender to play every defensive snap. He led the team in interceptions (4), and was second only to Derrick Johnson in tackles (92) and solo tackles(77). On December 26, 2010, Berry scored his first NFL touchdown on a 54-yard interception return against the Tennessee Titans. In his first playoff game, he recorded a career-high in solo tackles with 9 and passes defended with 4. On September 11, 2011, Berry suffered a torn ACL, and was placed on injured reserve on September 14, ending his season. Berry had surgery on September 29, 2011, and returned for the start of the 2012 NFL season. Berry has been named to four Pro Bowls, in 2010, 2012, 2013 and 2015. On September 14, 2014, Berry sustained a high ankle sprain against the Denver Broncos, with the injury keeping him off the field until Week 8. During a loss against the Oakland Raiders on November 20, 2014, Berry began to complain of chest pain. A mass was soon discovered in his chest, with him eventually being diagnosed with Hodgkin's lymphoma on December 8, 2014. Berry was placed on the Chiefs' non-football illness list, ending his season. Berry's doctor, Dr. Christopher Flowers, a lymphoma specialist at Emory University Hospital in Atlanta, said of Berry's diagnosis, "This is a diagnosis that is very treatable and potentially curable with standard chemotherapy approaches. The goal of Mr. Berry's treatment is to cure his lymphoma and we are beginning that treatment now." On July 28, 2015, the Chiefs announced through their official Twitter account that Berry had been cleared to resume football activities after he was declared clear of cancer nearly nine months after his initial diagnosis. Berry returned to the field gradually, but earned back his starting job and had a phenomenal season. He was selected to another Pro Bowl as the starting safety and many experts and coaches around the league remarked that he was the best safety in the entire NFL. He was named Comeback Player of the Year, as he helped the Chiefs to an 11-5 record and Wild Card berth, after overcoming Hodgkin's Lymphoma. The Chiefs placed the franchise tag on Berry on July 14, 2016. Due to both parties not agreeing on a long-term contract, Berry held out of all offseason training activities and eventually signed his $10.8 million franchise tender on August 28. Berry's father, James, played running back for the University of Tennessee from 1978 to 1981, and was a captain of the 1981 squad. Berry's younger brothers, twins Elliott and Evan, currently play football at Tennessee. Berry is the first cousin once removed of former All-Pro Tampa Bay Buccaneers linebacker Hugh Green. Berry suffers from equinophobia, a fear of horses, frequently brought on by the Kansas City Chiefs' mascot, Warpaint. ↑ "Kansas City Chiefs: Eric Berry". Kansas City Chiefs. Retrieved 2010-09-13. 1 2 3 UT Sports Information (7 September 2007). "Eric Berry #14". UTSports.com. Archived from the original on 2007-11-07. Retrieved 2007-09-07. ↑ Mike Strange (6 September 2007). "Williams Rewarded with First Start". Knoxville News Sentinel. Retrieved 2007-09-07. ↑ Bryan Mullen (29 November 2007). "UT's Berry, Lincoln earn freshman honors". The Arkansan. Retrieved 2007-11-29. ↑ Eric Berry. "Player Bio: Eric Berry". University of Tennessee Athletics. Retrieved 2010-12-22. ↑ UT Sports Information (29 November 2007). "Berry SEC Def. Frosh of Year, Lincoln top kicker". UTSports.com. Retrieved 2007-11-29. ↑ UT Sports Information (29 November 2007). "Berry Named Freshman A-A; Lincoln 2nd Team". UTSports.com. Retrieved 2007-11-29. ↑ "Berry humbly heroic". Chattanooga Times Free Press. Retrieved 2010-12-22. ↑ Jones, Jimmy (2008-10-20). "Berry coming through for Vols". Shelbyville Times-Gazette. 1 2 2011 NCAA Football Records Book, Award Winners, National Collegiate Athletic Association, Indianapolis, p. 12 (2011). Retrieved June 30, 2012. ↑ Casserly, Charley (April 26, 2010), "AFC draft: Rating top picks, intriguing players to follow", CBS Sports, He was a better prospect than Sean Taylor. ↑ Dawson, Chief (2010-04-26). "2010 NFL Draft: Eric Berry Fourth In Rookie Jersey Sales". Arrowhead Pride. Retrieved 2011-03-22. ↑ "Berry, Chiefs agree to six year, $60M contract just before camp" NFL.com, July 30, 2010. ↑ NFL.com, May 4, 2010. ↑ "Thirteen replacement players announced for Pro Bowl". NFL.com. Retrieved 2011-03-22. ↑ "Kansas City Regular Season Scoring Defense Stats 2009". NFL.com. Retrieved 2011-03-28. ↑ "Kansas City Regular Season Scoring Defense Stats 2010". NFL.com. Retrieved 2011-03-28. ↑ "Kansas City Regular Season Stats 2010". NFL.com. Retrieved 2011-03-28. ↑ "Chiefs place Eric Berry on IR". ESPN.com. September 14, 2011. Retrieved 2012-03-06. ↑ Smith, Michael (September 15, 2014). "Chiefs lose Eric Berry, Jamaal Charles to ankle injuries". ProFootballTalk.com. Retrieved September 15, 2014. ↑ Teicher, Adam. "Eric Berry has Hodgkin's lymphoma". ESPN. Retrieved 21 March 2015. ↑ "Chiefs, Eric Berry not expected to reach long-term deal, source says". ESPN.com. July 14, 2016. Retrieved September 26, 2016. ↑ Davis, Nate (August 28, 2016). "Eric Berry reports to Chiefs, signs franchise tag". USAToday.com. Retrieved September 26, 2016. ↑ "Eric Berry Stats". ESPN. ESPN Internet Ventures. Retrieved 13 February 2015. ↑ "Berry Twins Commit To UT", WBIR.com, 4 November 2013. Retrieved: 4 November 2013. ↑ Rick Stroud, "Tennessee Volunteers Safety Eric Berry Likes Idea of Being a Tampa Bay Buccaneer", Tampa Bay Times, 26 February 2010. ↑ Phil Axelrod, "Pitt's Football Recruiting: Win Several, Lose A Few", Pittsburgh Post-Gazette, 14 February 1978. Wikimedia Commons has media related to Eric Berry.